All CGC Guild members and the community are invited. Please bring some food to share for the potluck. CGC will provide coffee, tea, sparkling water and lemonade. Ina will have finished pieces to show during the workshop. Tea will be served (and perhaps Sake) to reveal the special beauty of his work. Please join us for an intriguing workshop by Japanese ceramic artist Inayoshi Osamu on Feb 14, 15 & 16th in the Ceramics Lab at COCC. This naturalistic approach embodies the unique Japanese aesthetic, wabi-sabi. Wabi-sabi is the most conspicuous and characteristic feature of traditional Japanese beauty and it occupies roughly the same position in the Japanese pantheon of aesthetic values as do the Greek ideals of beauty and perfection in the West. Wabi-sabi nurtures all that is authentic by acknowledging three simple realities: nothing lasts, nothing is finished, and nothing is perfect. 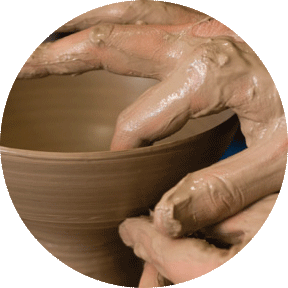 Whether you work on the wheel or hand build, this philosophical approach is an opportunity to expand your clay making repertoire.